Anun Uran Chinbat is a lawyer. 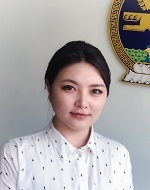 She currently works as a diplomatic government official at the Ministry of Mining and Heavy industry of Mongolia. Anun Ch serves as a Board member at the Erdenes Mongol LLC which is a state-owned enterprise (SOE) with a mandate to manage strategic assets and projects on behalf of the Government of Mongolia, since October 2017. Anun Ch holds LLM degree from School of Law, National University of Mongolia, and B.A in Business management from Rikkyo University in Japan and International School of Business in Japan. Mongolia is a mineral-rich country in Central Asia that boasts significant proven deposits of gold, copper, iron ore and coal. And the Mongolian government estimates that the country’s untapped mineral wealth is worth approximately $1.3 trillion. The minerals industry is a crucial part of the Mongolian economy, accounting for 22 per cent of GDP, 74 per cent of industrial output, 90 per cent of export earnings and 25 per cent of budget revenue. Therefore, the Ministry is focusing attention on projects targeted at fostering economic growth, producing value-added products and increasing jobs through encouraging investments. By doing so, we adhere to principles of consolidating partnership between government and private sector and cooperating openly with entities and investors to fulfil these objectives.